Comfortable pet-friendly rooms free internet access and free parking make La Quinta Inn San Diego Scripps Poway a popular pick with our guests. This non-smoking hotel is also praised for its great location and lush surroundings. 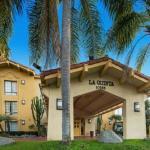 There are 120 rooms spanning four floors at La Quinta Inn San Diego Scripps Poway. Accommodations feature cable TVs with premium channels and modern furnishings. The hotel has an outdoor swimming pool whirlpool sun deck restaurant fitness center business center and meeting/banquet facilities. Guests can start each day with the Free Bright Side Continental Breakfast. La Quinta Inn San Diego Scripps Poway is located 20 miles from San Diego International Airport and is 15 miles from Old Town San Diego. Within 15 miles of the hotel guests will find Miramar Lake the Mission Basilica and the Westfield Mall. A bus stop is located within two blocks of the hotel. Dogs up to 60 pounds are allowed. There are no additional pet fees, but a credit card must be on file. Dogs must be crated when left alone in the room or place the Do Not Disturb sign on the door. Dogs must be leashed and cleaned up after.